President Donald Trump has said he is reversing a budget request to eliminate funding for the Special Olympics. His remarks came a day after education secretary Betsy DeVos was criticised for defending a proposed $17.6m (£13.5m) cut to the organisation, which is designed for disabled children. The request was included in Mr Trump's $4.75tn federal budget, which was not expected to pass Congress. Mrs DeVos responded she had pushed for funding "behind the scenes". "I heard about it this morning. I have overridden my people. We're funding the Special Olympics," Mr Trump said of the world's largest sport organisation for people with intellectual disabilities. Mrs DeVos rushed to clarify the contradiction on Thursday, tweeting: "I am pleased and grateful the President and I see eye-to-eye on this issue and that he has decided to fund our Special Olympics grant." 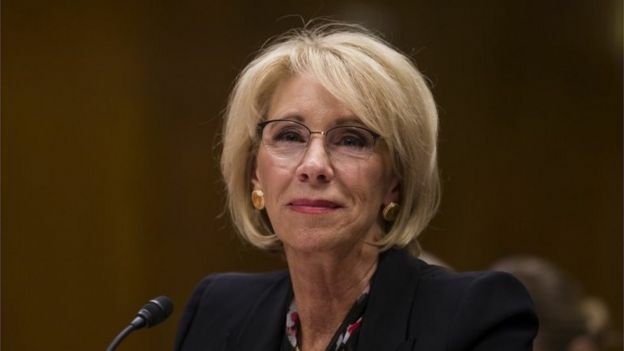 She had earlier told Congress the US Department of Education had to make "tough choices" following a 10% cut to her agency's budget, adding that the nonprofit group should be funded through private donations. The cuts came as part of the administration's proposed budget for the 2020 fiscal year, which totals $4.75tn, the largest in federal history. The budget request slashed $17.6m in funding for the Special Olympics, about 10% of the nonprofit organisation's overall revenue. Majority of the group's support comes from individual and corporate donations as well as fundraising campaigns. Why is Betsy DeVos so unpopular? The spending plan also included more than $1tn in cuts to the Medicaid health programme for the poor and disabled, while allotting $8.6bn for the US-Mexico border wall. But the budget proposal is not expected to pass Congress, which must approve it. Who would the cuts affect? 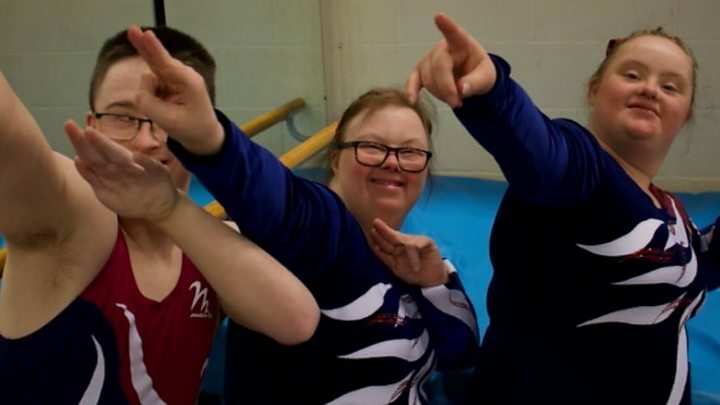 Andrea Cahn, the Senior Director of Unified Champion Schools for Special Olympics who runs the Unified Champion programmes in the United States says the budget cuts would have affected programmes in 6,500 schools. "The funding we receive from the US Department of Education is specifically for our Unified Champion schools programming," says Ms Cahn though the budget cuts would not impact any state games, world games, or any ongoing competitions that are scheduled. Raymond S Kellis High School in Arizona is one of the schools that has adopted this type of programme. It has enabled children with intellectual disabilities to be more outgoing says Michael Wakeford, a special education teacher and Unified Sports coach at the school. "It helps our society bring faith back to humanity in a divisive world in a place where it's easy to fear what we don't know and to fear what we don't understand," Mr Wakeford adds. The Special Olympics, founded in 1968 in Washington DC, provides year-round training, health education, community building and athletic competition for children and adults with intellectual disabilities. It currently serves over five million athletes across 190 countries. The sports organisation is separate from the Paralympics, which are mostly for elite athletes who have physical disabilities. Both groups are recognised by the International Olympics Committee. The US Special Olympics chapter provides trainings and competitions in 18 sports, including soccer, swimming, equestrian and basketball. The Special Olympics World Games, which took place in Abu Dhabi earlier this month, are held every two years.